Solid Signal unveils a new product specifically designed for the commercial market! 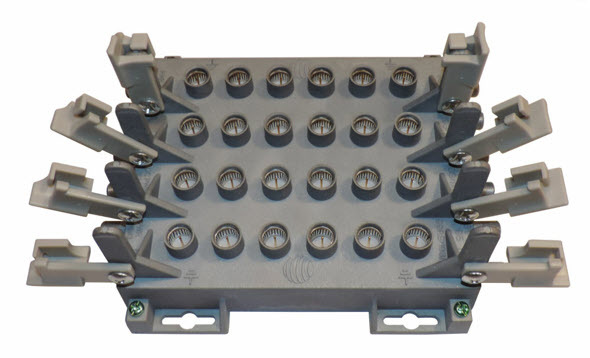 The new DSWM SWM Expander is AT&T’s first officially approved product for connecting four DSWM multiswitches using one chassis. I saw this product in a private showing. I have to tell you, it’s impressive. In large commercial installs, space is always at a premium. With most large systems you can’t use just a single multiswitch. The new SWM-30 multiswitch lets you control up to 24 receivers in a compact package that’s much smaller than the old SWM-32. Still, it may not be enough for some systems. In a recent install, Solid Signal’s installers connected twelve SWM-30s together. This part would have been really great to have back then. The SWM Expander lets you connect four SWM-30 multiswitch into a wall-mount chassis. You use only two power inserters to power it all. 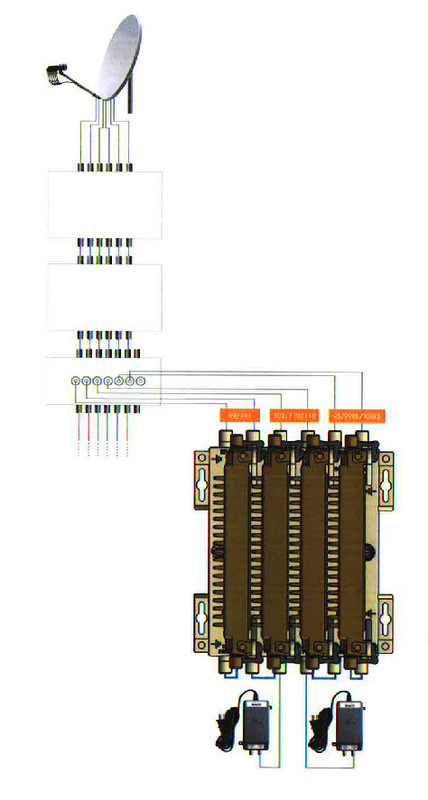 A single set of six cables feeds all four switches. This eliminates the need for separate splitters, and cuts down on the number of power inserters and power strips. Heat is also managed more effectively. Unlike other products designed to help you connect multiple SWM multiswitches, this expander can keep your SWM-30s safe and sound even while wall-mounted. This means it will meet most local building codes, even those in California and other earthquake-prone areas. Of course you have to check your local ordinances, but AT&T folks are pretty confident here. The SWM Expander is the only AT&T-approved part for feeding multiple SWM-30s through a single set of cables. The only other approved option is a set of splitters like the Perfect Vision PV23-302. While the splitters are less expensive, it’s just not a clean install and that can matter when space is an issue. If you’re doing a D2 or DRE installation, you must use 100% AT&T approved parts and in some cases your bill of materials must be approved in advance. You won’t get approval if you’re using a non-approved expander or shelf. As I said, I had the opportunity to preview one of these units a while back and I was very impressed. While I’ve seen other products like this, the DSWM SWM Expander is the first one that combines push-on connections with locking clips, making it very easy to mount this on a wall. There is plenty of air gap between the multiswitches and this means heat isn’t as much of an issue. It also helps that the SWM-30 runs a lot cooler than a SWM-32 or SWM-16. Installation is easy as you see in the diagram above. If you’re doing a commercial install you should always be running six lines even if you’re not ready for 4K, so all 6 go into one end of the expander. Two PI29-Z’s go on the other end. Short jumpers connect them to the power ports of the SWMs. The whole module takes up about the same amount of space as flat-mounting a SWM-30 on the wall, so even if you have a small closet you could very easily feed 96 receivers or 24 5-tuner Genies. In the past I have not been so supportive of other expander-type products because they simply took the place of multiple splitters and didn’t really save space. This is the first product I’ve seen that actually saves space. It also works in a headend rack quite easily where space is always at a premium and clean wiring is always appreciated.